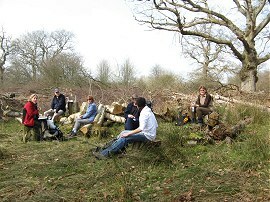 We did this walk on Sunday 20th March with seven of us setting off from Lye Green. 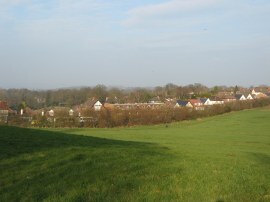 From Lye Green the path heads up to Groombridge before linking up with the route of the Tunbridge Wells Circular Walk which shares its route with the High Weald Landscape Trail for the remainder of the day to our end point in Pembury. 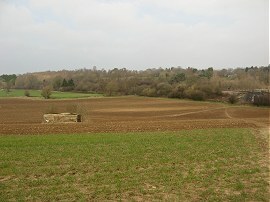 From our parking spot off Whitehouse Lane it was just a short walk along the road to rejoin the route of the High Weald Landscape Trail as it joins a footpath opposite Whitehouse Farm which heads alongside a field edge, photo 1, towards Legg Wood. 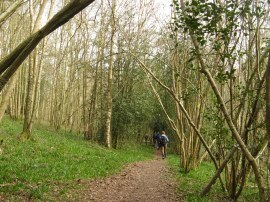 The route heads through the trees, where we the ground underneath the trees was carpeted with the green leaves of bluebell plants which will doubtless be very attractive in a few weeks time. Leaving the trees the route heads over a field towards a house before heading uphill across a couple of fields to reach the road at Summersales Hill where is seemed like at this point I had probably already had more feet of ascent than during all the previous weekend walk along the Thames path. At the road the High Weald Landscape Trail heads to the left for a short distance before joining a driveway on the right. This leads up to a small group of houses before the path bends round to the left along a field edge path. Leaving the field the path then continues ahead over a low grassy hill surrounded by trees, photo 3. 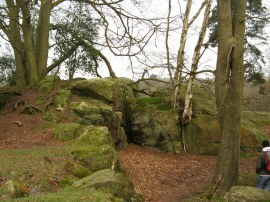 Reaching the end of the open ground the path heads by an attractive sandstone outcrop surrounded by trees, photo 4, before heading downhill through Jockeys Wood where an ornamental lake and folly were just visible through the trees to the left of the path. 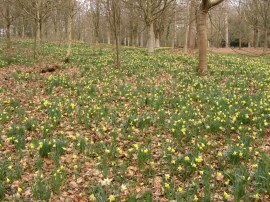 After crossing a small footbridge the path headed through an area that had been planted with Daffodils, photo 5, before continuing ahead along a path running alongside the Mottsmill Stream. 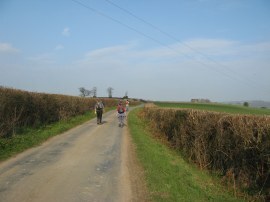 The path then bends round to the left to head up to the Motts Mill Road. This road is followed to the right for a while before the route joins a footpath on the left that heads through another band of trees, photo 6, the route once again running alongside the Mottsmill Stream. Leaving these trees the footpath headed along a narrow grassy meadow where a number of deer ran across the path in front of us, including a stag with a set of antlers. 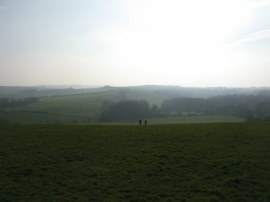 At the end of this space the path bears to the left away from the trees, heading briefly uphill to join a path that heads diagonally across open farmland, guarded by a couple of old World war two pill boxes. The weather had steadily been improving since we had set off and on reaching the field most of us had warmed up enough to remove a fleece or jacket. The footpath heads over the fields towards a bridge under some railway lines, photo 7, before the path heads over a grassy field beside a waterworks to join Corseley Road on the outskirts of Groombridge. Here the High Weald Landscape Trail heads to the left, crossing over a stream before heading uphill into Groombridge where the path passes by the start (or end) point of the Forest Way which we had walked along for a while during stage 3. (At some point I would like to walk all the Forest Way, combining it with a walk along the Worth Way which runs from East Grinstead to Crawley, which would make a decent days walk if I can get the transport links sorted out or find someone to do it with me). Corseley Road is followed as it bends round to the right and where the road bends sharply to the route continues ahead along a footpath which runs down the side of a school. 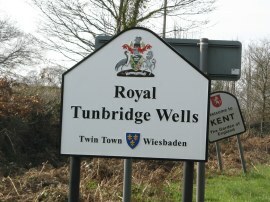 This is the point where the High Weald Landscape Trail links up with the Tunbridge Wells Circular walk and for the rest of the day I was walking on paths I had already walked along, all be it in the opposite direction. 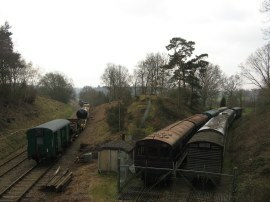 This short stretch of footpath leads down to a broad bridge which crosses over the railway lines of the Spa Valley railway, photo 8, before the path continues ahead over a field towards Birchden. Just before the road is reached we headed briefly to the right before joining a footpath on the left that runs through trees alongside the entrance to the car park in Aytton's Wood. 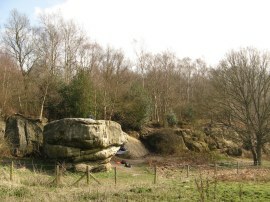 Passing the car park, where there are some public toilets, the route leaves the trees to enter a grassy meadow running between the Spa Valley Railway lines and the higher ground to the left of Birchden Wood and Harrison's Rocks, photo 9. Entering this open space Tommy found a geocache hidden in a tree which was quite a good find as it was hidden in the opposite direction to that which we were heading. The path then runs through the grassy meadow alongside the railway lines before heading through a gate into the trees where we stopped for a short break on a handy pile of logs, photo 10, where Tommy found another geocache nearby. Leaving the trees the path heads round to Forge farm before joining what was in places a rather muddy hedge lined lane. Fortunately the path surface soon improved as the route heads up towards Pinstraw Farm and along a lane to reach Eridge Road. Here the route heads to the right for a few hundred yards before joining a footpath on the left. 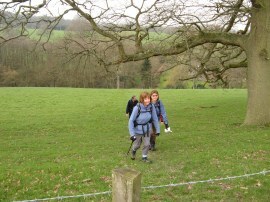 Here the route heads alongside a field edge and through a small patch of trees before joining a footpath that heads gently uphill across the middle of a large open field, photo 11. 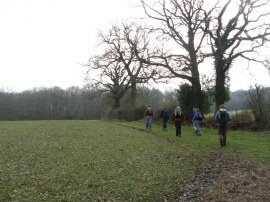 This is followed up towards the buildings of Warren Farm before crossing Warren Farm Lane to join a path heading into another area of woodland which the route follows round to the Eridge Rocks, photo 12. Here the High Weald Landscape Trail heads to the left, following the road down to the busy A26 Eridge Road at Eridge Green by the Holy Trinity Church. We only had to walk a few yards to the right down this road before our route joined a footpath on the left. 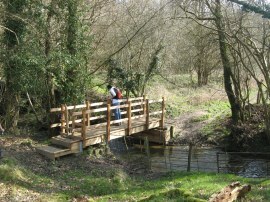 This runs along the edge of a couple of fields before bending round to the right and heading downhill to cross a new wooden footbridge over a small stream, photo 13. 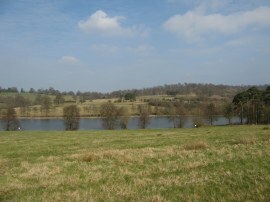 The path then runs through the trees of Forge Wood before heading to the left to join a broad track running across the middle of a large grass covered field with views over a lake and Eridge Park to the left, photo 14. 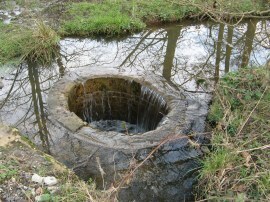 This track is followed to a bridge over a small stream where the water flows under the track through a rather unusual circular drain, photo15, which looked rather like a small well. Here the route joins a narrower section of path which follows a tall deer fence round the edge of an open area with trees to the left. 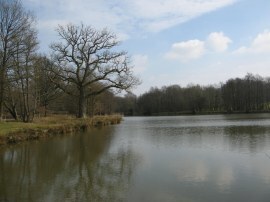 This is followed to another smaller lake or pond, photo 16, where the route heads to the left, crossing over the end of the lake to join a broad track running along the edge of Whitehill Woods. Before heading down this path we stopped for our lunch break on another set of logs, photo 17, with pleasant views across the water. Suitably refreshed we then joined the rather muddy track that runs alongside the edge of Whitehill Woods which is followed for some distance before the route begins heading uphill along the edge of a patch of open ground. 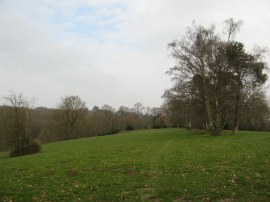 This leads into another patch of trees and a steeper section of path which leads up to the A267 road on the edge of Frant. After a short wait to allow everyone to catch up we headed to the left up the road before heading to the right across the Green in Frant, photo 18. 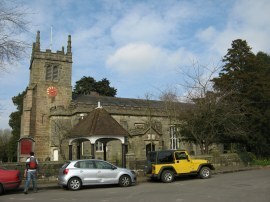 Here we passed the bench where I had stopped for my lunch break on the Tunbridge Wells Circular Walk before continuing ahead along Frant High Street towards St Albans Church, photo 19, where once again the views of the picturesque buildings were spoilt by parked cars. Leaving the road we headed through the Lych Gate, which has a weather vane built into the ceiling, and followed a path round the side of the church where Dave spotted a trig point on the side of the church building, photo 20. Leaving the churchyard the route heads down the side of a couple of fields, crossing over a track before bending half right into the trees of Chase Wood. The path heads through the trees and then along an enclosed path running between two fields which leads up towards Brickhouse Farm where the route turns left, and then right, along a track that runs past the farm buildings up to the B2169 Bayham Road, photo 21.The High Weald Landscape Trail continues ahead across the road along a footpath that runs along the edge of the Nevill Golf Course. 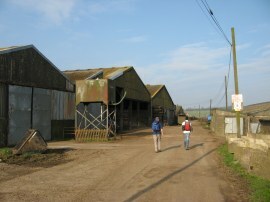 This section of footpath, which leads up past the club house and car park, runs along the border between Kent and Sussex and is followed up to Benhall Mill Road. 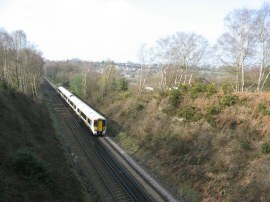 Here the route heads to the right, following the road round to cross over some railway lines, photo 22, before joining a driveway on the left. We had a short wait here as Sara and Chris attempted to give directions to a lost driver before heading down past a couple of houses to some paddocks. In the paddocks was a large pig asleep in the sun and a number of different sheep and we stopped again for another quick chat with their owner before continuing in our way past the paddocks to join a tree lined stretch of path running between fields. 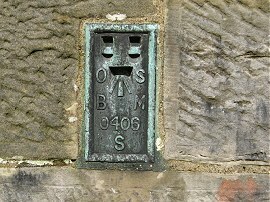 This heads to the right, then left, to join the driveway leading to Tuttys Farm which is followed up to the Hawkenbury Road. 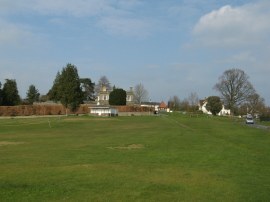 Here we headed to the left for a short distance before joining a footpath on the right that runs along the edge of a field with playing fields to the left, which leads up into High Wood. 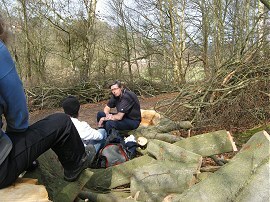 Here the path heads through the trees for a short distance to reach Highwoods Lane, photo 23. This is a quiet, dead end road, that is followed to the right for the best part of a mile as it winds its way across the top of a ridge from where there were extensive, if somewhat hazy, views across the wealden countryside on either side. After stopping for a short break we followed the lane to its end point by the very very smelly Little Bayhall Farm, photo 24. I had remembered the farm being quite smelly from a few years ago and this time around nothing had changed. 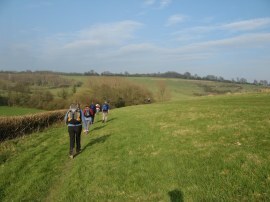 Shortly after passing the farm and a couple of isolated cottages the route joins a footpath running downhill alongside the edge of the field, photo 25. Reaching the bottom of the hill the route heads to the right for a short distance along a farm track before turning to the left to enter a large grassy meadow which was being grazed by a few cows. 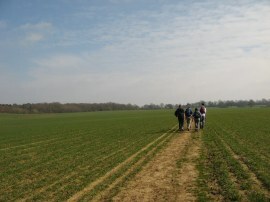 After crossing a small marshy area the route starts heading steadily uphill on a vague path across the field. This was one of the longest ascents of the day and as we headed steadily up the hill towards Pembury great views opened up over the countryside we had been walking across, photo 26. Once we had all regrouped at the top of the hill we headed to the right along a hedge lined lane running parallel to the top of the field before heading to the left along a footpath that led to a footbridge over the A21 dual carriageway. Once over the road the path heads down the edge of a field, photo 27, to join the Hastings Road on the outskirts of Pembury which was where we had parked our cars at the start of the day. Reaching the cars we had walked 14.8 miles for the day, almost all of which had been on the High Weald Landscape Trail. Despite having walked most of this part of the route before it was a very enjoyable day out through fine countryside in almost perfect walking weather. 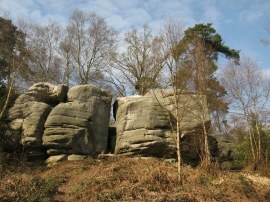 I have uploaded the route of the walk which can be accessed here: HWLT stage 4 Route.